On a beautiful sunny day overlooking the Channel Islands Harbor in Southern California, a crowd of approximately 400 people viewed all-electric and plug-in hybrid vehicles being exhibited by private owners and dealers. Among current models, 10 separate vehicles were represented with 27 total vehicles. Included in the display were two vehicles converted to all battery electric--a 1957 Mercedes 190SL and a Volkswagen Beetle. Also were a 1958 Sport Rider, one of the first street-legal all-electric vehicles available in the United States, an Elf, and a GEM 825. A county Air Pollution Control District representative was present distributing discount vouchers to residents wanting to purchase or lease new EVs or PHEVs at steep discounts under a local government subsidy program. As a result of this NDEW exhibition and the available government discount program, at least two people purchased a new Mercedes B250 all-electric sedan and others showed a sincere interest to buy an EV/PHEV. 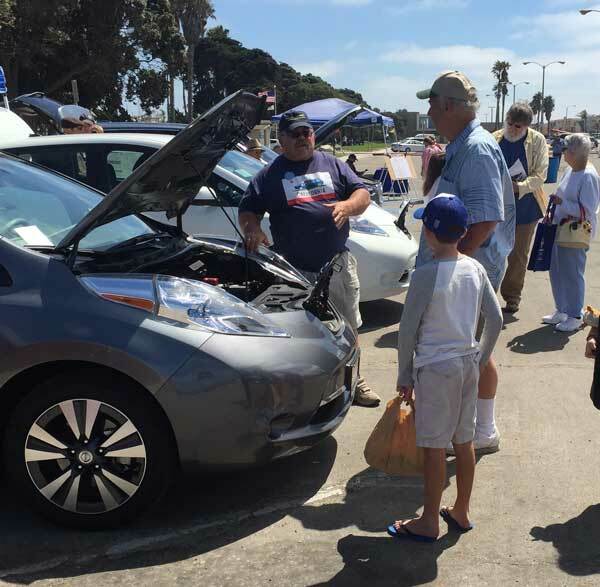 Kent Bullard describes the features and operation of his 2015 Nissan Leaf to interested attendees at the National Drive Electric Week exhibition held at the Channel Islands Harbor near Oxnard, California on Sunday, September 11, 2016. The event had well over 25 cars represented by owners as well as many dealers. Local Electric Vehicle and Plug-In Hybrid owners, and local dealers that sell EVs/PHEVs will have their cars on display situated south of Sunday's Farmers Market. Let us tell you about our experiences of EV and PHEV ownership. Late model vehicles appearing at the event include the Tesla Model S sedan, the Tesla Model X SUV (both with Autopilot), the Nissan Leaf. Come join us and let us answer your questions about the EV/PHEV world. A real, one-to-one, hands on opportunity for you to learn the benefits of EV or PHEV ownership and see the vehicles. Good for you, good for the environment, and beneficial to your bottom line. Presented by Los Padres Chapter Sierra Club. Registered attendees report 250,745 electric miles driven.